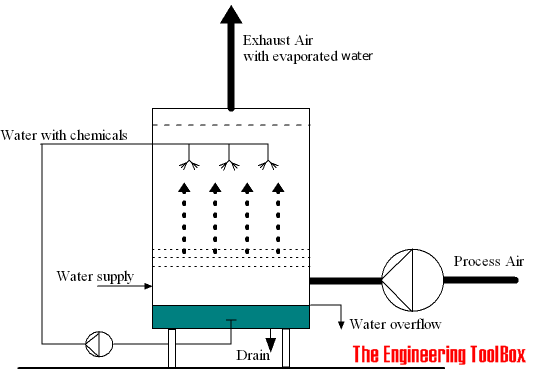 A schematic drawing of a typical spray nozzle scrubber configuration is shown below. Note! Be aware that low temperature scrubbers can be a potential source for the Legionella disease. Special cleaning and disinfection precautions should always be taken when the temperature in the scrubber is in the "Legionella range". Engineering ToolBox, (2003). Scrubber Basics. [online] Available at: https://www.engineeringtoolbox.com/scrubbers-air-washers-d_139.html [Accessed Day Mo. Year].